Myth: The tryptophan in turkey is not enough to make your drowsy (there is actually more of the chemical in cheese and chicken!). So when you get tired after eating, blame the overindulgence in fatty food. And while napping during the football game might seem like a good idea, a better idea for increased energy is to go on a brisk, post-feast walk. Not only will you get your blood circulating, heart rate up and thus an avalanche of energy, but you’ll also be burning off some of the pie you just ate! Shirataki noodles; 20 calorie pasta substitute! I'll be the first to admit that I'm not a soy product lover...I love meat! But, I just recently found a calorie bargain noodle substitute...and I love it! In my house we have spaghetti once a week and I normally substitute grilled veggies for noodles to save on calories (a cup of pasta is over 200 calories...yikes), and sometimes I miss that noodle-y taste and texture. 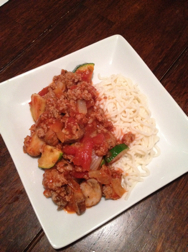 So I tried shirataki noodles and they rock! For 40 calories in the entire bag (1/2 is a serving), you can eat them to your heart's content. They can be found in the refrigerated pasta section of your grocery store. Just make sure to rinse and boil them for about 3-4 minutes to get rid of the soy taste. Enjoy! This hummus recipe was the greatest hit at a recent girls get together. I would love to claim it as my own, but It's my friend Missie's recipe. Enjoy! The cannellini beans provide a smoother consistency which makes for a nice change from the traditional hummus made with garbanzo beans. It’s also very easy to modify this spread into whatever kind of taste you’re craving. I’ve done Mexican versions (replacing the basil for canned chipotle chilis & limes), Greek versions (using feta, jarred roasted red peppers, and lemon), and even Indian (adding in some garam masala & turmeric for color). Place beans, garlic, yogurt, lemon juice and salt into food processor. Secure lid in place and while mixture is processing, slowly drizzle in truffle oil through spout. Stop & taste and repeat with adding additional EVOO until desired smooth consistency for base. Can also add more yogurt if mixture needs additional moisture. Add in basil leaves and red pepper flakes and process until smooth. I tend to let the food processor run for a minute or so at this point, it incorporates air into the puree and makes for a nice texture. Taste again and adjust the seasonings as necessary (e.g. more basil, salt, garlic, etc). All measurements are approximations so alter amounts according to your own personal preferences. Serve with toasted pita chips.